Be tikrosios garbės: Mūšis dėl Faludžos 2004 by Francis J. "Bing" West Jr.
We’d love your help. Let us know what’s wrong with this preview of Be tikrosios garbės by Francis J. "Bing" West Jr.. 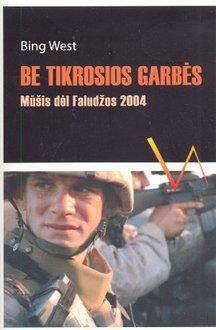 Preview — Be tikrosios garbės by Francis J. "Bing" West Jr.
Francis J. "Bing" West Jr.
To ask other readers questions about Be tikrosios garbės, please sign up. In “The Iliad” a warrior in the front ranks turned to his companions and said, “Let us win glory, for ourselves, or yield it to others.” For Greek warriors, there was no true glory if they were not remembered afterward in poem or song. There will be no true glory for our soldiers in Iraq until they are recognized not as victims, but as aggressive warriors. Stories of their bravery deserved to be recorded and read by the next generation. Unsung, the noblest deed will die. Those stories are recorde In “The Iliad” a warrior in the front ranks turned to his companions and said, “Let us win glory, for ourselves, or yield it to others.” For Greek warriors, there was no true glory if they were not remembered afterward in poem or song. There will be no true glory for our soldiers in Iraq until they are recognized not as victims, but as aggressive warriors. Stories of their bravery deserved to be recorded and read by the next generation. Unsung, the noblest deed will die. Those stories are recorded in No True Glory: A Frontline Account of the Battle for Fallujah. A Star for every brave warrior here. Read and pass these deeds on to the next generation. A must read for any student of war and for any who want a better picture of what happened in Iraq. Bing West gives you a lot of action at the squad, company, regiment level but mixes in timely pieces of the higher level machinations and confusion. You can’t understand how Fallujah happened the way it did without seeing how it fit in a bigger picture. I admire how he explains all the military and political forces in play. He is very fair in his assessment and mostly just gives you the facts and lets you make your own judgment. Several things stand out but especially the Marines, from the generals down to the corporals and privates. They demonstrated how they can be your best friend or worst enemy. I also like that West portrayed the opposition clearly. Bing West served as a Marine officer in Vietnam, then moved on to journalism. Here he accompanied some Marine units during the battle of Falujah and offered both his day-to-day account of their experiences and his observations on the higher level political maneuverings that shaped the events they lived through. One of the best books ever written about Marines in combat. Captures the culture of the Corps in peace as well as in war. Provides background on Fallujah, the terrain, the culture, the history. A must read for serious students of modern history, the Iraq War, and the United States Marine Corps. I was there for part of this battle (in 2004). This book details all the battles surrounding what was once the most dangerous city in Iraq. I picked this up at the National Museum of the Marine Corps near Quantico, VA last weekend. A detailed and in-depth account of the Marine's experiences in Fallujah, Iraq in 2004. I loved the matter of fact style and the Marine's eye view that West uses to tell his story. Part personal narrative from the combatants point of view and part historical narrative of the military and civilian leaders, their decision making, and the operations as they unfolded. West is quite confident that his opinions a I picked this up at the National Museum of the Marine Corps near Quantico, VA last weekend. A detailed and in-depth account of the Marine's experiences in Fallujah, Iraq in 2004. I loved the matter of fact style and the Marine's eye view that West uses to tell his story. Part personal narrative from the combatants point of view and part historical narrative of the military and civilian leaders, their decision making, and the operations as they unfolded. West is quite confident that his opinions are correct - maybe even strident at some points but, his story is a good one and he tells it in a way that is compelling. Once again we learn about war from the perspective of the Marine on the ground who is merely there to do a job - to serve, and how that job - as much as these Marines would wish otherwise - always ends up terribly politicized. Read about how the politicians initially called for the Marines to "take" Fallujah overwhelmingly and immediately after the American contractors were killed and hung from the bridge in town, despite the Marine's initial misgivings (they were practicing established counter-insurgency techniques and wanted time for these techniques to pan out). When orders came to attack, the Marines did what Marines do best only to be called off mid operation because of the political fall out from the unsavory images beamed around the world. This is another reminder of the terrible costs of unleashing our combat power and how these decisions should be made carefully and then once made, should be carried through to completion. If our leaders are going to choose to use our military tool, they need to use it as a last resort and then they need to practice a certain amount of "nose holding" because it's going to get messy and ugly. If they are unwilling to offend anyone - including the Arab media which has huge built-in sympathies to anyone we may be fighting in the middle east - then they'd better not turn lose the dogs of war. I was 17 when the siege of Fallujah was beginning in 2004. As I graduated High School I paid a little more attention to the news as I had friends going into the Marine Corps and being deployed. Admittedly I wanted to read this book because after the war I had no idea about our strategy with the city or the politics involving it. I just knew that even today in 2018 "Fallujah" is a synonym often used for a hard fight or quest. "It's not exactly Fallujah" has been used to describe an easy situation I was 17 when the siege of Fallujah was beginning in 2004. As I graduated High School I paid a little more attention to the news as I had friends going into the Marine Corps and being deployed. Admittedly I wanted to read this book because after the war I had no idea about our strategy with the city or the politics involving it. I just knew that even today in 2018 "Fallujah" is a synonym often used for a hard fight or quest. "It's not exactly Fallujah" has been used to describe an easy situation, for example. I think the book needs to be updated to reflect present-day events. General Mattis is now the SECDEF. Col Dunford is now the Chairman of the Joint Chiefs. Zarqawi was killed in an airstrike a couple of years after the USMC swept Fallujah, and I was absolutely stunned to learn that Sadr is now a politician in Iraq. I loved how the book would describe the political situations in one chapter and then seemingly in the next it would discuss a very detailed, squad-level minute by minute account of house clearings and clashes with the insurgents. Bing West gives a glimpse into Anbar province, Iraq as it was in 2003-2005, during 20 months of attempts to stop, or even slow, the violence in that region. The author served as a Marine in Vietnam and was Assistant Secretary if Defense in the Reagan years. He interviewed numerous soldiers and Marines to put together sometimes street by street accounts. I was struck by the way that many smart folks tried plans to work the problem only to be held up, pulled back, and then forced forward by politi Bing West gives a glimpse into Anbar province, Iraq as it was in 2003-2005, during 20 months of attempts to stop, or even slow, the violence in that region. The author served as a Marine in Vietnam and was Assistant Secretary if Defense in the Reagan years. He interviewed numerous soldiers and Marines to put together sometimes street by street accounts. I was struck by the way that many smart folks tried plans to work the problem only to be held up, pulled back, and then forced forward by political pressure that had nothing to do with the reality on the ground. West is interested in showing individual acts of bravery in the midst of sometimes chaotic events and he does this well. He routinely shows the pointlessness of how many Iraqis died in the fighting, sent forward poorly armed and seldom trained to shoot at soldiers who would have to then return fire, often easily cutting down life. At other times, better trained insurgents would coordinate ambushes with equally devastating effects against coalition forces. Overall, his point is not so different from the conclusion of Michael Moore in Fahrenheit 911. Though I suspect there is much on which the two would disagree, both West and Moore view with great seriousness any decision to send men and women into harms way on behalf of others. Those sent to kill or die on our behalf ask only that the cause be worth the risk. Bing West explores the strategy and history that lead to Operation Phantom Fury, the Marines push to capture the city of Fallujah. It truly catches the many mistakes the U.S. Military and government made throughout the planning process. The first attempt was stalled by a long one-sided cease fire. To fix the violence the U.S. wanted to send in the Iraqi national guard, but no unit was ready for the fierce fighting in the city. Finally the military made a decision to send in the former Iraqi army Bing West explores the strategy and history that lead to Operation Phantom Fury, the Marines push to capture the city of Fallujah. It truly catches the many mistakes the U.S. Military and government made throughout the planning process. The first attempt was stalled by a long one-sided cease fire. To fix the violence the U.S. wanted to send in the Iraqi national guard, but no unit was ready for the fierce fighting in the city. Finally the military made a decision to send in the former Iraqi army, the Fallujah Brigade. This decision was made without consulting civilian leaders. Unfortunately, the Fallujah Brigade held loyalties towards the insurgency creating mor violence within the city walls. All this lead to the final push that destroyed they city and killed and wounded many Americans and Iraqis. What I liked about this book was that it not only critiqued the government but also the decisions the military made. However, it does make the Marines seem flawless and knights I shining armor. And is unapologetic for the violence the U.S. caused I. The city. Extremely well told story of the Battle for Fallujah. The first and second battle for Fallujah, which took place in April 04 and November 04 respectively. Bing West puts you into battle with the Marines and tells numerous harrowing tales of frontline bravery and valor. Bing West also tells of the events that occurred behind the scenes and the causes and propellants of the battle and of the political alliances, betrayals and compromises that shaped the battle and caused it to be split up into two Extremely well told story of the Battle for Fallujah. The first and second battle for Fallujah, which took place in April 04 and November 04 respectively. Bing West puts you into battle with the Marines and tells numerous harrowing tales of frontline bravery and valor. Bing West also tells of the events that occurred behind the scenes and the causes and propellants of the battle and of the political alliances, betrayals and compromises that shaped the battle and caused it to be split up into two phases instead of one decisive blow that would have ended the insurgency in one swift stroke of US military might. Bing West also does a good job of setting the stage for the battle by explaining what led up to and the aftermath of the battle, as well as the peripheral effect the battle had on the overall war, public opinon of the war and Iraq as a whole. 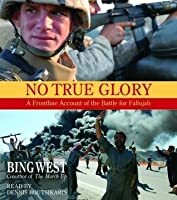 No True Glory provides a concise account of both battles for the Iraqi city of Fallujah, in April 2004 and December of 2004 respectively. West is an excellent author for this subject matter, providing a description from both the personal and tactical Lance Corporal while relating the operational and strategic context between events on the ground and on the home front. Unfortunately, aside from the heroic sacrifices and mastery of modern urban combat displayed by our Marine Corps, the lesson that No True Glory provides a concise account of both battles for the Iraqi city of Fallujah, in April 2004 and December of 2004 respectively. West is an excellent author for this subject matter, providing a description from both the personal and tactical Lance Corporal while relating the operational and strategic context between events on the ground and on the home front. Unfortunately, aside from the heroic sacrifices and mastery of modern urban combat displayed by our Marine Corps, the lesson that remains unlearned by national leadership is that without a proper strategic objective, tactical gains will be forfeit, and left to recapture at precious cost. Excellent read. "...let slip the dogs of war." Bing West has his finger on the pulse of the Corps with this one. Some of my buddies were in the battle for Fallujah in '04 and have given this book their seal of approval. Doesn't get more authentic than that. 5 stars- what more can I say. A powerful book. Research reading for SHARP SHOOTER. Excellent book. As I write this review, the United States of America is still shell shocked by the brutal terrorist killings that occurred in San Bernardino, California in November 2015. Sadly, the country doesn’t appear to be united. President Obama and the far left think that stricter gun laws can prevent such atrocities whereas those on the far right, including presidential candidate Donald Trump, are essentially wanting to ban all Muslims from the United States. War is hell. I only say this because the whole As I write this review, the United States of America is still shell shocked by the brutal terrorist killings that occurred in San Bernardino, California in November 2015. Sadly, the country doesn’t appear to be united. President Obama and the far left think that stricter gun laws can prevent such atrocities whereas those on the far right, including presidential candidate Donald Trump, are essentially wanting to ban all Muslims from the United States. War is hell. I only say this because the whole Iraq mess seemed to culminate from the terrorist attacks on 9/11. We went to war believing Saddam Hussein was hoarding Weapons of Mass Destruction. Since most agree that we had faulty intelligence and no weapons were found, what could we do now that we’ve committed ourselves? Well, the good news is that Hussein was toppled from power, and forced to flee (he was eventually found, and systematically executed). The Iraqi people rejoiced, and our 24 hour news coverage showed a jubilant population celebrating in the streets while ransacking his ubiquitous palaces and statues that wallpapered Baghdad. The problem was, what happens next? Here’s where most people, excluding the political astute, simply were clueless. Many believed that we could “destroy” Iraq and then somehow rebuild the backwards country to resemble the state of Vermont. Those who know better knew better. This book puts us right in the middle of the nastiest place in Iraq, the ugly grime-filled city of Fallujah. This is the last place where anyone would want to be during a war. A bit like the Siberian Front in World War II. What author Bing West manages to do is tell a very thorough account of the frontlines during this calamity that begin in April 2003. He spends equal time talking about the battles with several of the key players on the ground, as well as many involved in the military and political leadership. The author shows us that there’s a very big disconnect going on here. Fortunately, this is not a “Pro War” nor an “Anti-War” book. The author manages to focus on war, and any war is extremely unpleasant. While reading, I couldn’t help draw many parallels to the U.S. involvement in Vietnam. A big criticism of that war is that it seemed as though the U.S. wanted the South Vietnamese to win the war more than the South Vietnamese did. Such seems to be the case here. Even with Saddam Hussein gone, you can’t expect a nation that has been embroiled in a set way of living to suddenly throw all the shackles off and embrace democracy. Even after Saddam is gone, there are rife political sides, and most still hate America. A sad analogy: If you adopt a five-year-old dog that has been abused and tormented its whole life, that dog will never be “normal”, no matter how much love you shower upon it. So America really wants to help. Money is spent. Money is given to Fallujah and Iraq. Lots of money. That will inspire them. Right? Nope. So we give more money. More decisions are made, more disagreements between leaders, more frustrated marines on the battlefield. etc. etc. You have to admire the marines for wanting to get the job done. They know they have the manpower to obliterate this hell-hole, and they’re highly motivated after seeing all of the injustice and nastiness firsthand. But we can’t fight wars that way anymore. Not with CNN reporting every move we make. Sadly, casualties in a war always expand beyond the enemy on the frontlines. Buildings get bombed containing innocent civilians, and the 24 news networks are quick to make these the lead stories, which then drives up animosity for any conflict. So President Bush knows he has to be careful. One needs to only remember the Abu Gharib prison story that made headlines during all of the Fallujah crap. Most Americans can probably tell you more about that incident than they can the whole Fallujah episode because, let’s face it, a story about prisoners being unjustly tortured makes sensational headlines. Hindsight tells us that even though we were finally “successful” in Fallujah, nothing has really changed. Imagine turning on your kitchen lights at 2 a.m. and seeing 100 cockroaches. If you’re lucky, you can kill about 5 of them, but the rest will scurry under the surface, multiply, and be back the next night. And the cockroaches in Fallujah have guns and homemade bombs. Like Vietnam, we may have dropped a lot of bombs and killed far more of the enemy than what we lost, but until you break the psyche of the enemy (as we did with Germany and Japan), you can never really say that you’ve “won” the war. We were never able to accomplish that in Iraq, and Fallujah was where this was at its ugliest. "In war, Authority and responsibility should reside in the same organization." CHAOS - This is a riveting and detailed account of Fallujah, the political brawl down to the horrors of battle. The author provides a wide scope of the Battles for Fallujah from the perspective of the top brass including CENTCOM, the Coalition Provisional Authority (CPA), the fledgling new post-Saddam Iraqi government, and the individual generals, commanders, and soldiers on the ground. This book covers the period of t "In war, Authority and responsibility should reside in the same organization." The author provides a wide scope of the Battles for Fallujah from the perspective of the top brass including CENTCOM, the Coalition Provisional Authority (CPA), the fledgling new post-Saddam Iraqi government, and the individual generals, commanders, and soldiers on the ground. This book covers the period of time soon after the overthrow of Saddam's regime, beginning when three former military Blackwater Contractors were murdered, burned, mutilated and hung from a bridge in Fallujah. Fallujah was also a major hub for extremists, the recruitment center for local and foreign insurgents, and bomb making capital that produced the deadly IED's that led to the deaths of so many of our troops. To make matters worse, the city is filled with hundred's of mosques. Due to established Rules Of Engagement (ROE's) that prohibited the targeting of mosques or even entry by non-Islamic allies, they were ideal locations for terrorists to safely and quietly recruit and deploy death upon our troops. The author specifically follows the Marines and writes extensively of General James Mattis (Mad Dog), his heroic actions and the manner in which he would insert himself into battle. Discusses the diplomat challenges in Iraq following the fall of Saddam Hussein. Another major subject were the decisions made by Paul Bremer, administrator of the Coalition Provisional Authority (CPA). He was responsible for disbanding Iraqi police force, members of the former military and professionals who were previously members of the Baath party during Saddam's reign. These decisions made by Bremer we're very unpopular and counterproductive. This led to the rise of the insurgency following Saddam's disposal. Iraq's most skilled and experienced military and civilians and operators were immediately out of work, regardless of what solidarity they may ore may not have had with their former leaders. The chaos that ensued was a major contributing factor behind the violence and unrest that led to the first and following invasions of Fallujah. "The Western Press covered incidents of misconduct more full than the multiple instances of bravery such as that of Sgt Norwood. The stupid corrupt acts of Abu Ghraib prison cast a shadow over the decency of hundreds of thousands of other soldiers." Al Jazeera engaged in information warfare and false and misleading propaganda for the benefit of the insurgents. "Al Jazeera's repeated assertion of horrendous civilian casualties, buttressed by selected pictures evoked sympathy and anger in Iraq and worldwide." "The singular lesson from Fallujah is clear. When you send our soldiers into battle, let them finish the fight. Ordering the Marines to attack, then calling them off, then dithering, then sending them back in constituted a flawed set of strategic decisions. American soldiers are not political bargaining chips." "The General (James Mattis) traveled light, with three or four Humvees and a command LAV (light assault vehicle) outfitted with six radios... more than once Mattis was thrown out (during sharp turns). The men enjoyed moving with Mattis. They saw the countryside and they saw action. They were hit three times by IED's and fought off two ambushes, losing one Marine and having three injured. Some on the staff believed the insurgents were targeting Mattis, who shrugged off the warnings. In an LAV he could move around, stopping wherever he wanted, without covering anyone in dust with the backwash from a helicopter. Mattis never mentioned the attacks. " "At a few places, they had left the dead where they had fallen. When Corporal Villalobos of Batallion 3/4 had shot up cars careening toward his position, one of the drivers lay out in the field where he had been shot, unattended. The body, black with flies had swelled and split apart, the stink of rotting death wafting into the house where Villalobos and his squad lived. They doused the body with gasoline and tried to burn it which only increased the mess. A dog carried off a roasted thigh. This is a wonderful story about men who not only persevere against the enemy, but also their own government within whom the politicians are more interested in poll results and re-election than winning on the battlefield. As a retired Naval Officer, what pissed me off the most about stories like this is that we could have taken Fallujah early in the war if we had allowed the people at the pointy edge of the sword to make decisions. And, while we would have taken casualties, it would have been noth This is a wonderful story about men who not only persevere against the enemy, but also their own government within whom the politicians are more interested in poll results and re-election than winning on the battlefield. As a retired Naval Officer, what pissed me off the most about stories like this is that we could have taken Fallujah early in the war if we had allowed the people at the pointy edge of the sword to make decisions. And, while we would have taken casualties, it would have been nothing like the death and destruction needed to liberate the city the second time. Boring, boring, boring, boring. "One bullet away" is overlong, but explains the same issues (namely popping into a country uninvited then defending indefensible positions against the entire population of the country which wants the occupiers out) succintly and with more involvement than "No true glory". Maybe a good book for those who mistakely thought that the wars in Iraq and the North Africa had any purpose at all and benefits for the locals or the "simple Americans/Europeans". Hint: They don' Boring, boring, boring, boring. "One bullet away" is overlong, but explains the same issues (namely popping into a country uninvited then defending indefensible positions against the entire population of the country which wants the occupiers out) succintly and with more involvement than "No true glory". This is an outstanding book. As a former Marine I read anything about the Corps with a voracious appetite. However, I often have to check myself when it comes to criticism about the Corps, helping to keep my outlook objective and be aware of mistakes and weakness where it is found. This book was brutally honest about the administration, command elements involved, the Marines in the fight and the reality of the Fallujah conflict. What an incredible book about Marine's in combat. This book shows what happens when politics gets in the way of war. Many died because of the political games of the Iraqi's and Bush administration, hence the title. Great insight into how Gen Dunford (currently JTS) and Gen Mattis (Currently SecDef) built their worldview. This book is about the US military’s operation in Fallujah from the time the first troops were on the ground in that city and leading up to the Marines’ assault towards the end of 2004. There is so much that people don’t understand about the US military’s approach towards Fallujah and so many mistaken assumptions and factually incorrect claims of what the US military did. I think this book makes an important contribution towards understanding what happened. I don’t think many people could write This book is about the US military’s operation in Fallujah from the time the first troops were on the ground in that city and leading up to the Marines’ assault towards the end of 2004. There is so much that people don’t understand about the US military’s approach towards Fallujah and so many mistaken assumptions and factually incorrect claims of what the US military did. I think this book makes an important contribution towards understanding what happened. I don’t think many people could write a book like No True Glory. I appreciated the author’s background that helped this book tremendously. The author is himself a former Marine officer whose experience as a platoon leader who led men into combat in Vietnam helped him have an eye of capturing the operational history at the tactical level from the perspective of rifle companies and at times even down to the fire team. Furthermore the author was also at one time an assistant secretary of defense and an analyst for the RAND Corporation so this experience definitely allows him to consider the larger perspective as well. Even as he describes the complexity of politics from the angle of international opinion, Iraqi politics and the US government internal turf battles, the author is primarily focused on operational history and how those complexities shapes the military approach towards Fallujah. What I appreciate the most about the book is its description of the hostility within Fallujah with the arrival of the first American troops. I learned from this book that Fallujah itself was never “attacked” during the invasion and the first American troops came after the initial invasion was over. The author does a good job describing the demographics of the city, with its population largely subscribing to the Sunni Islamic sect and therefore key figures in Saddam’s Sunni-minority government came from Fallujah including politicians and generals. The book also described the sheiks’ attempt to hold to their former power, while radical clerics compete with them in being anti-American. These factors along with the fact that historically Fallujah has a long history of being hostile towards outsiders fueled the insurgency. What I also enjoyed a lot from this book is the description of various military units in trying to bring about stability and security to Fallujah. Starting with the first Army units to the Marines taking over, we see various approaches being used, from the strong armed tactics to the use of soft power and military leadership and units that were sophisticated in their approach of counter-insurgencies. I think students of military counter-insurgencies must read this book because Fallujah is a good case study and the book didn’t just covered one stint of a combat unit but a longer timeline for further evaluation. For readers who are not aware, the author Bing West has been critical of some of the aspect of General Petraeus’ counter-insurgency’s doctrine. I think West has valuable input both in his discussion elsewhere and also indirectly with what he has to say in this book. I think Bing West’s discussion of the Marines’ leadership in Fallujah reveal that there were others besides Petraeus who were profoundly thinking about counter-insurgency and sometimes Petraeus’ personality and publicity has put Marine generals such as Conway and Mattis in the shadows. At the end of the day the thing I like the most about the book is the story of military men and their commanders trying their best with the difficult situation at hand. I learned from this book something I didn’t know before such as the Commandant of the Marine Corps actually visiting Fallujah when it was dangerous. I also have a more deeper respect of Marine General Mattis whom I respected a lot serving under him in the first year of Iraq. Mattis is well known to most Marines for leading the invasion of Afghanistan and Iraq but here we see in this book that General Mattis has another side to him, that he is a greater thinker and understood the need for change of strategies and the need for nuance counter-insurgencies when most were slower to come around. I was surprised at how much Mattis himself put himself in danger even in Fallujah in which he often visited the troops in the front and went to town personally. His trips were far from safe, and his command element have been ambushed and Marines in his details killed. Readers would also appreciate the account of young Marines battling in dangerous urban warfare both in April 2004 and November 2004 operation. Good story with many players. I had some trouble with there being so many acronyms. I repeatedly had to stop and search in the book or Google it to find the words. Like the battle itself, No True Glory comprises mostly lead-up - skirmishes, ambushes, politicking, and the like. It's all told intensely nonetheless. Incredible what some people will do for the person to their left and right. About Francis J. &quot;Bing&quot; West Jr.
Francis J. "Bing" West is an author and former Assistant Secretary of Defense for International Security Affairs during the Reagan Administration. His 2004 book The March Up: Taking Baghdad with the First Marine Division, written with United States Marine Corps General Ray L. Smith,was awarded the Marine Corps Heritage Prize for non-fiction, as well as the Colby Award. Books by Francis J. &quot;Bing&quot; West Jr.